Elements Applied: The commonly applied elements are seeds and bulb. Active Components: An alkaloid, named colchicine, is a remedy for pains associated with gout. Used For: Colchicine, a toxic alkaloid, is applied in medicine for arthritis and gout. The herb itself is highly poisonous. Its minor quantities can lead to fatality. The remedy should not be applied for any purpose and in any case. 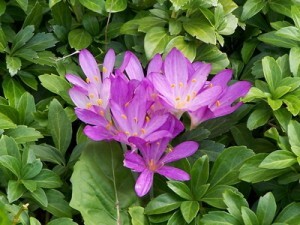 Additional Info: Autumn crocus is a plant of a long lifespan which can be discovered in damply areas, like woodlands, and in mountain regions. It may reach 1 foot high. The plant has large leaves which appear in spring and cover the seed pot, which matured previously. In autumn a white-purplish flower appears on a stem. The period of blossoming lasts from August to October. Preparation and Intake: Caution! Forbidden for internal use. Safety: Caution! The plant and any of its elements is highly poisonous and may lead to fatality. The bulb appearance is very close to that of an onion. The signs of poisoning are vomiting and burning feeling in the throat, accompanied with kidney or respiratory failure.